Findings in the Files: Carried! This next "finding" is familiar to most of us. And if you've lived long enough, you have found the message of this familiar poem to be so true. For us it was in 1998 when our then 20 year old son was diagnosed and treated for cancer. 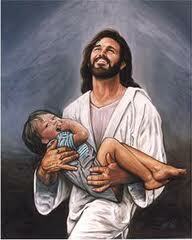 The Lord literally carried us! Have you experienced the carrying of the Lord? When was this true for you? One night I dreamed I was walking along the beach with the Lord. Many scenes from my life flashed across the sky. In each scene I noticed footprints in the sand. Sometimes there were two sets of footprints, other times there were one set of footprints. This bothered me because I noticed that during the low periods of my life, when I was suffering from anguish, sorrow or defeat, I could see only one set of footprints. So I said to the Lord, "You promised me Lord, that if I followed you, you would walk with me always. 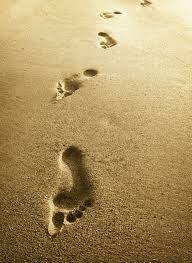 But I have noticed that during the most trying periods of my life there have only been one set of footprints in the sand. Why, when I needed you most, you have not been there for me?" 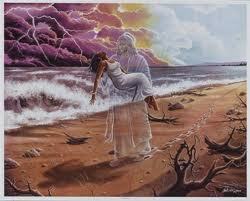 The Lord replied, "The times when you have seen only one set of footprints, is when I carried you."